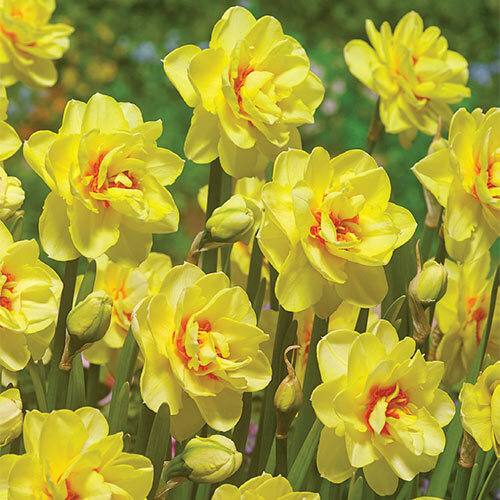 Any landscaping project, no matter how large or how small, will benefit from the addition of this breathtaking double daffodil. Sunny Day is a marvelous variety that features bright yellow double blooms accented by whirls of bold orange petaloid segments near their centers. The flowers sit atop strong, straight 16-18" stems that keep them visible in a border planting, container garden or even as a fresh indoor arrangement. Sunny Day looks amazing in a mixed bed alongside other mid-spring varieties in hues of white, red or purple. A good perennializer, it comes back year after year with little to no care or maintenance. Plant 6" deep and 4 - 6" apart.